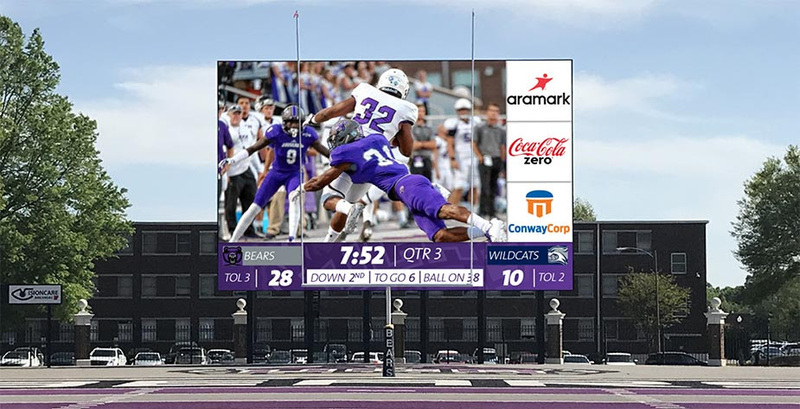 Daktronics has been asked by the University of Central Arkansas to design, manufacture, and install a new LED video display at Estes Stadium in Conway, Arkansas. 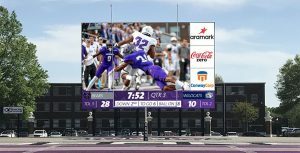 The 1,944-square-foot video scoreboard will inform and entertain Bears fans at football games in 2019. The new LED technology will measure 36 feet high by 54 feet wide and will feature a 15HD pixel layout to show crisp, clear imagery to every seat in the stadium. The display will feature industry-leading environmental protection from the outdoor elements and superior brightness to cut through direct sunlight on game days. The display features all of today’s technological expectations including variable content zoning which allows it to show one large image or to be divided into multiple zones of content. It can show live video, instant replays, up-to-the-minute statistics, graphics and animations, sponsorship messages, and any combination thereof. Delay of game clocks and a four-input switcher were also included with the installation. Daktronics will also be including its powerful Show Control System with this installation. This system provides a combination of display control software, world-class video processing, data integration, and playback hardware that forms a user-friendly production solution.